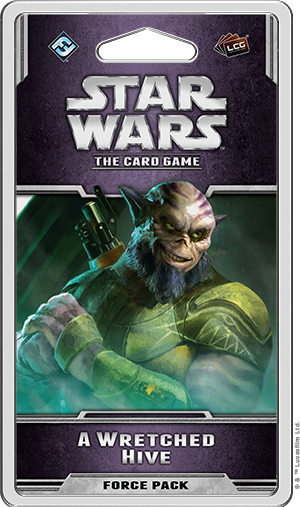 Fantasy Flight Games is proud to announce A Wretched Hive, the second Force Pack in the Opposition cycle for Star Wars™: The Card Game! Ancient rivalries and feuds that span generations have long guided the course of the Galactic Civil War, deciding the fates of thousands of beings on countless worlds. The Imperial Navy hunts the beleaguered forces of the Rebel Alliance. Smugglers and spies fight in the shadows with the galaxy’s scum and villainy. The Jedi and the Sith play out the endless struggle between the dark and light sides of the Force. Yet there are more rivalries to be found than the obvious lines drawn between factions. There is opposition between order and chaos, between the physical and the intellectual, between those who stand alone and those who work together with their friends. 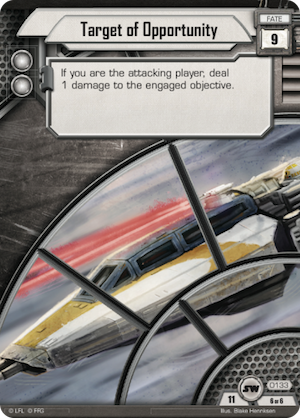 You’ll get a closer look at these and plenty of other interactions in the second Force Pack of the Opposition cycle. A Wretched Hive continues to expand on the primary themes of the Opposition cycle, highlighting the differences between groups of opposing factions and bringing new ways to fight your battles to the forefront. You’ll also see more of the characters of Star Wars: Rebels entering the game for the first time, such as Agent Kallus and Zeb Orrelios, alongside recognizable scum like Dr. Evazan and Ponda Baba. 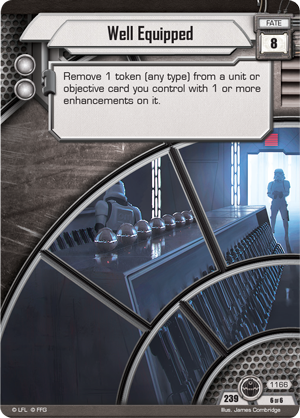 Pursue your favorite vendettas with the second Force Pack of the Opposition cycle! The Imperial Navy has access to nearly infinite resources and manpower. It controls shipyards across the galaxy, its navies enforce blockades on dozens of worlds, and every year, the Imperial Academy churns out more pilots, soldiers, and officers to support the regime. With these giant systems fueling the Imperial military machine, you can easily invest a few resources improving the capabilities of your units on the field of battle. The enhancements that you can afford with your massive income are the main focus of the Imperial Navy objective set in A Wretched Hive. The first enhancement included in this set allows you to promote one of your units to Squad Leader (A Wretched Hive, 1164). 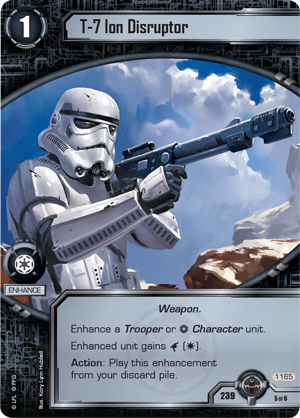 This enhancement is free to play, and can be attached to any Trooper or Imperial Navy Character unit, giving that unit the elite keyword. 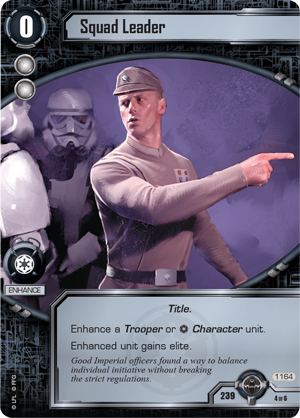 Obviously, elite is one of the most important keywords in the game, especially for holding the Balance of the Force or opposing units with tactics icons. Alternatively, you could equip your units with a T-7 Ion Disruptor (A Wretched Hive, 1165), one of the most fearsome weapons in the galaxy. Like Squad Leader, the T-7 Ion Disruptor can only enhance a Trooper or an Imperial Navy Character unit, and it grants that unit two additional combat icons—increasing its deadliness in battle. It should also be noted that this enhancement gets around the traditional drawbacks of enhancements. Normal enhancements are discarded when the enhanced unit is destroyed, meaning that you’ve lost the additional resources you invested in that unit. 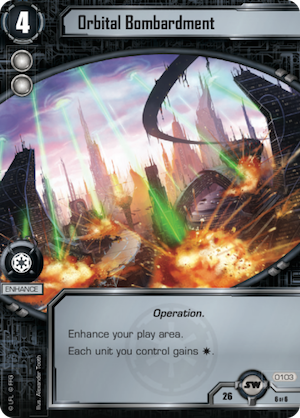 The T-7 Ion Disruptor is discarded as normal, but as an Action, you can play this enhancement from your discard pile, ensuring that your units can have the Weapons they need as soon as they need them, even in the middle of combat. These enhancements, and enhancements in general, are the focal point of this set, so you won’t be surprised to see them supported by a unit like the Academy Engineer (A Wretched Hive, 1163). When the Academy Engineer enters play, you can immediately search the top five cards of your deck for an enhancement and add it to your hand. 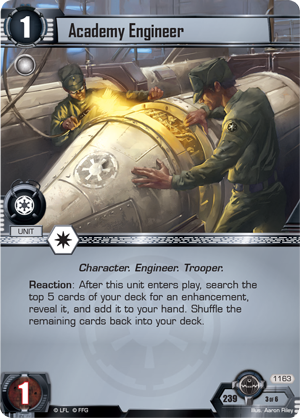 Whether you need more resources, or you’re searching for a specific card like Orbital Bombardment (Core Set, 103) or Rule by Fear (Imperial Entanglements, 874), the Academy Engineer can get you the cards you need, when you need them. You can reap additional benefits from enhancing your units with this set’s objective, Pattern Analysis (A Wretched Hive, 1161). While you have Pattern Analysis in play, each non-Vehicle unit with one or more enhancements gains edge (1)! 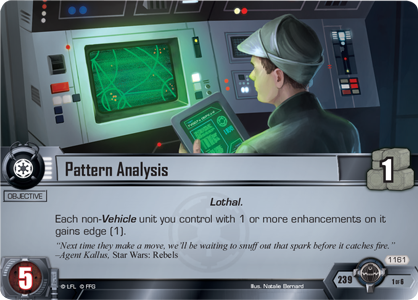 Although this won’t help your ships with Pilots, Pattern Analysis can certainly provide an edge boost to your other units, helping an area where the Imperial Navy has traditionally struggled. Enhancing your units also enables you to use one of the new fate cards introduced in this cycle, Well Equipped (A Wretched Hive, 1166). This fate card contributes two Force icons to your side of the edge battle, but additionally allows you to remove one token of any type from a unit or objective card with one or more enhancements. You may pull off a focus to open up a surprise attacker or defender, or you may remove a damage to prevent a crucial unit from being destroyed. 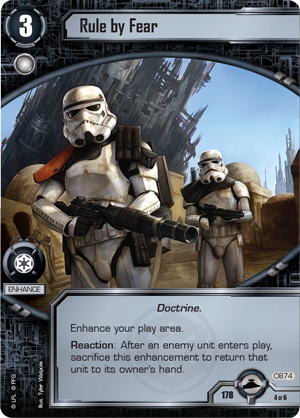 In addition, because this fate card triggers before Target of Opportunity (Core Set, 133), you might even save the game by protecting one of your objectives. Finally, this objective set concludes with a unit who’s well worth enhancing: Agent Kallus (A Wretched Hive, 1162), one of the villains of Star Wars: Rebels. 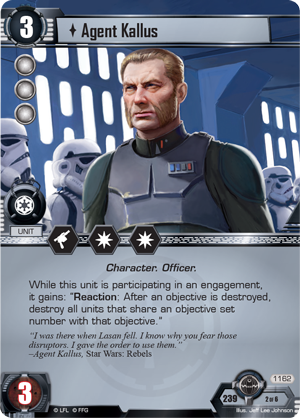 Agent Kallus excels at attacking your opponent’s objectives, because while he’s participating in an engagement, he gains, “Reaction: After an objective is destroyed, destroy all units that share an objective set number with that objective.” By choosing your engagements carefully, you may punch a hole in your opponent’s forces even as you destroy his objectives. 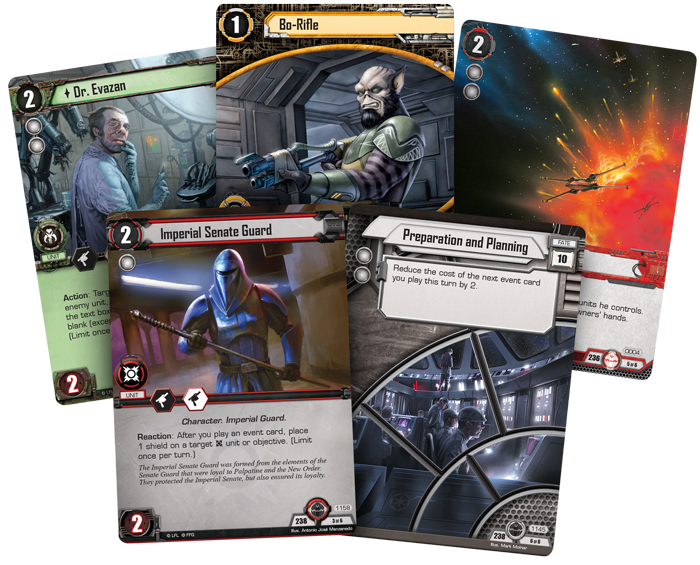 With this Force Pack and throughout the Opposition cycle, you can bring the rivalries of the Galactic Civil War into your games of Star Wars: The Card Game. Look for A Wretched Hive at your local retailer in the third quarter of 2016!